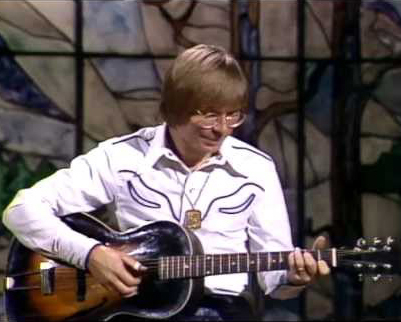 October 12, 1997 – John Denver, was born Henry John Deutschendorf Jr in Roswell, New Mexico on December 31st 1943. At the age of 12, he received a 1910 Gibson acoustic jazz guitar from his grandmother and he taught himself to play it well enough to play locally as a teenager in groups such as the folk-music group “The Alpine Trio”. John went on to become one of the most popular acoustic artists of the 1970s in terms of record sales, he recorded and released around 300 songs, about 200 of which he composed himself. He was named Poet Laureate of Colorado in 1977. Songs such as “Leaving on a Jet Plane”, “Take Me Home, Country Roads”, “Rocky Mountain High”, “Sunshine on My Shoulders”, “Thank God I’m a Country Boy”, “Annie’s Song” and “Calypso” attained worldwide popularity. Among his varied projects and interests, John founded his own environmental group, the Windstar Foundation and had a keen interest in solutions to world hunger. He visited Africa during the 1980s to witness first-hand the suffering caused by starvation and to work with African leaders toward solutions. In 1983 and 1984, John hosted the annual Grammy Awards. In the 1983 finale, he was joined on stage by folk-music legend Joan Baez with whom he led an all-star version of “Blowing in the Wind” and “Let The Sunshine In”. John has received 9 awards in honor of his music, including 2 grammies and an Emmy, and was inducted into the Songwriters Hall of Fame in 1996. A year later he was tragically killed when the light experimental aircraft he was piloting crashed into Monterey Bay, California. He died Oct. 12, 1997 at age 53.